Why You Always Test the Pinterest Crafts Ahead of Time! 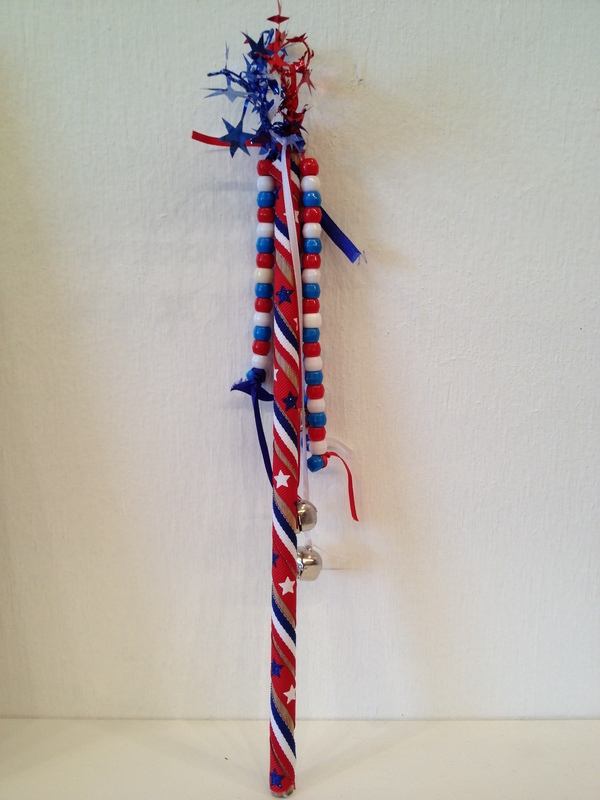 Helen set out to make one of these Patriotic Wands by screwing an eye hook into the end of a dowel. 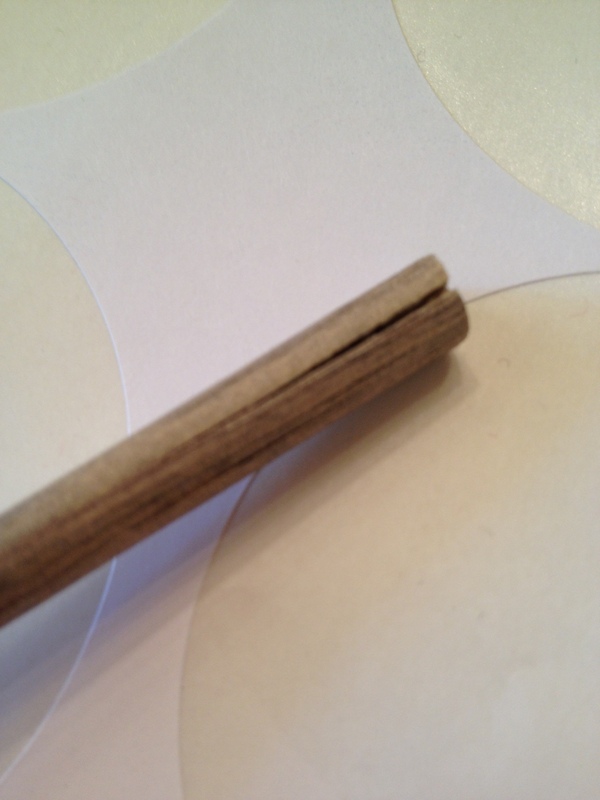 Our first dowel was too skinny and split immediately. 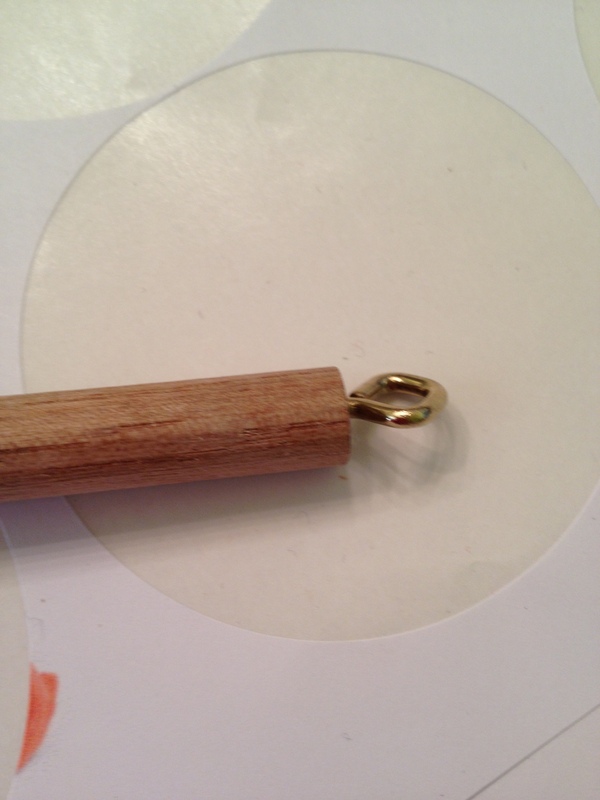 Our second choice was a little thicker and she got the hook all the way in, but the dowel spit in the end. 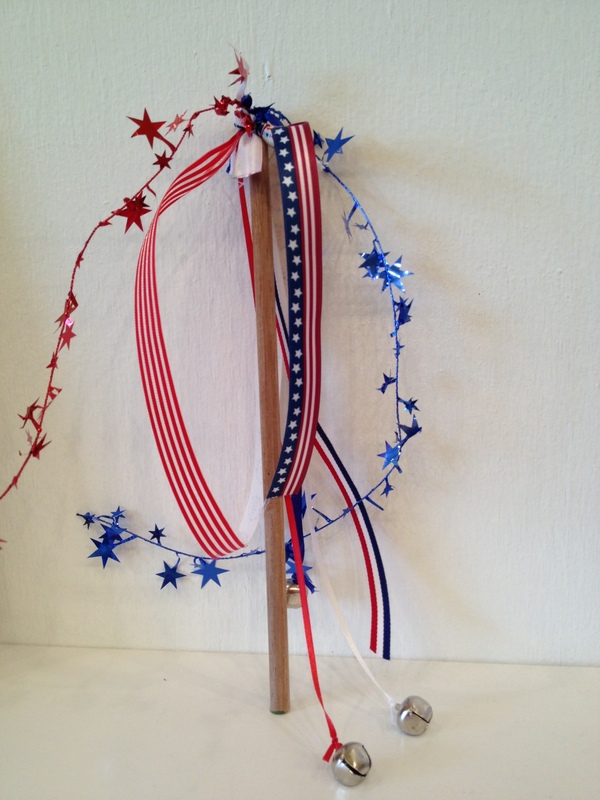 Next came the adornments – ribbons and sparkly wire. 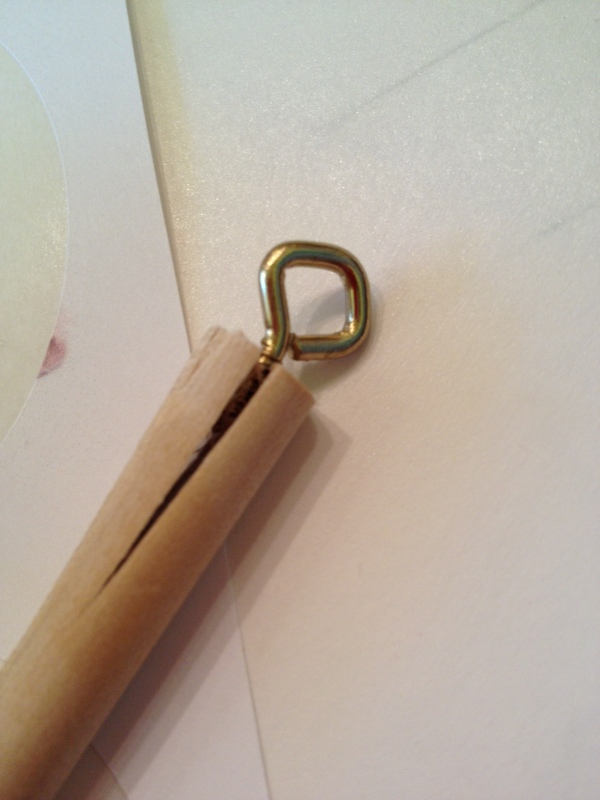 Helen quickly realized that little hands weren’t going to be able to thread more than one ribbon (if we were lucky) through the tiny hole of the eye hook, let alone work with the wire without poking themselves. So we rethought our craft and decided to attach all the ribbons before the kids arrived. We wanted them to have a hand in the decorating somehow so we added beads to the overall look which they could string on some of the ribbons. Because really, who doesn’t love beads? 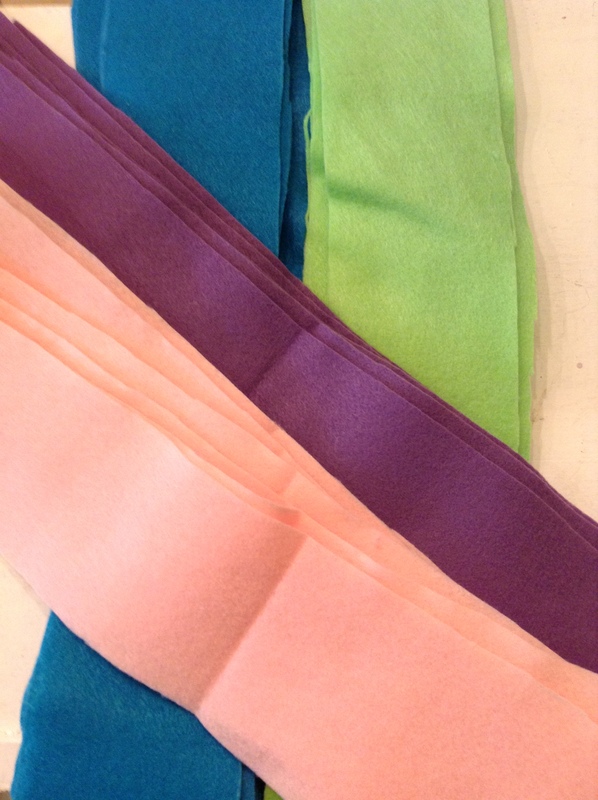 As you can see, we’ve added ribbon to the handle as well because it looks pretty! 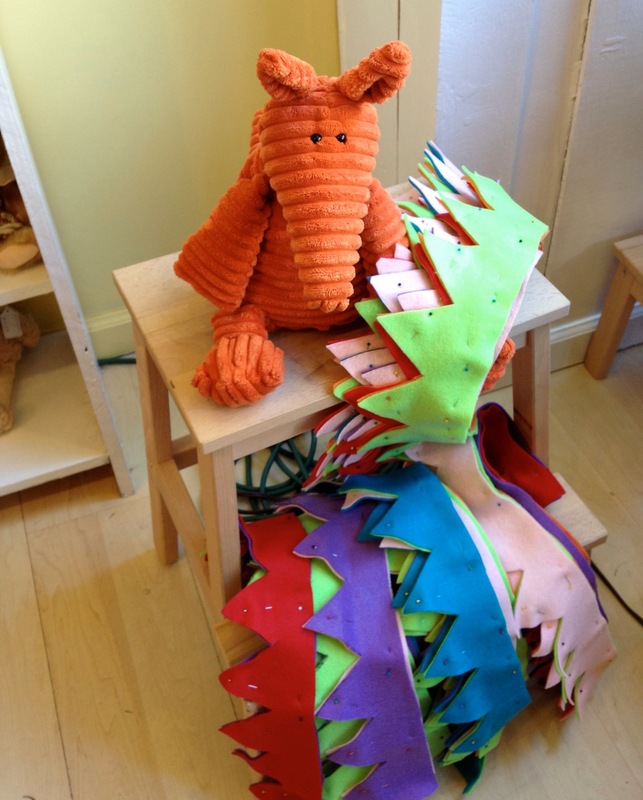 Hopefully we’ll have lots of little ones stopping by this weekend to make their own and we’ll share pictures of those next week. 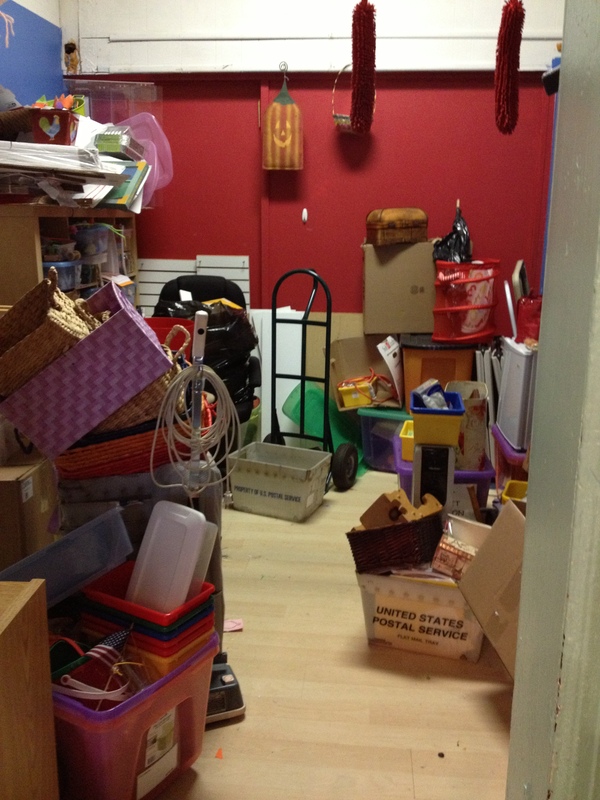 We’ve started cleaning out the back room at Fragile Earth. Although it still needs a LOT of help, progress is being made! You can see the floor now 🙂 Want to guess why we’re putting in all this hard labor? 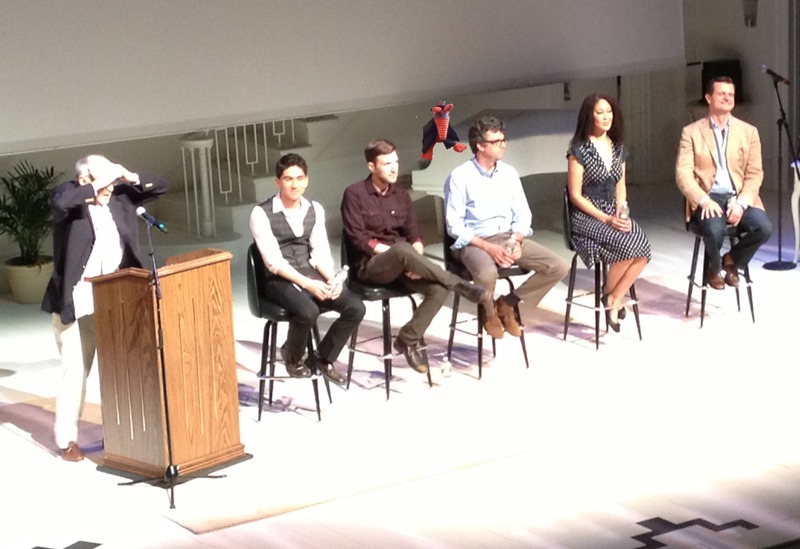 Sunday night, Helen and I were invited to the unveiling of the Two River Theater 20th Anniversary Season. It was wonderful to hear John Dias, the Artistic Director, describe the new shows and the reasons behind choosing them for the upcoming season. One of the most moving moments for me was during Bob Rechnitz’s opening statement when he asked how many people in the audience had seen the very first show (The Cocktail Hour) that they produced 20 years ago, and then how many had see every show the Two Rivers has put on during the two decades it’s been running. We were amongst some dedicated theater goers!! Clive was devastated he was not invited to attend with us and he has put himself in my photo showing where he thought he should be sitting during the speeches. He even wore his Zorro outfit in his excitement. We’ve found one way to get parents’ attention is to have something for the kids to do. 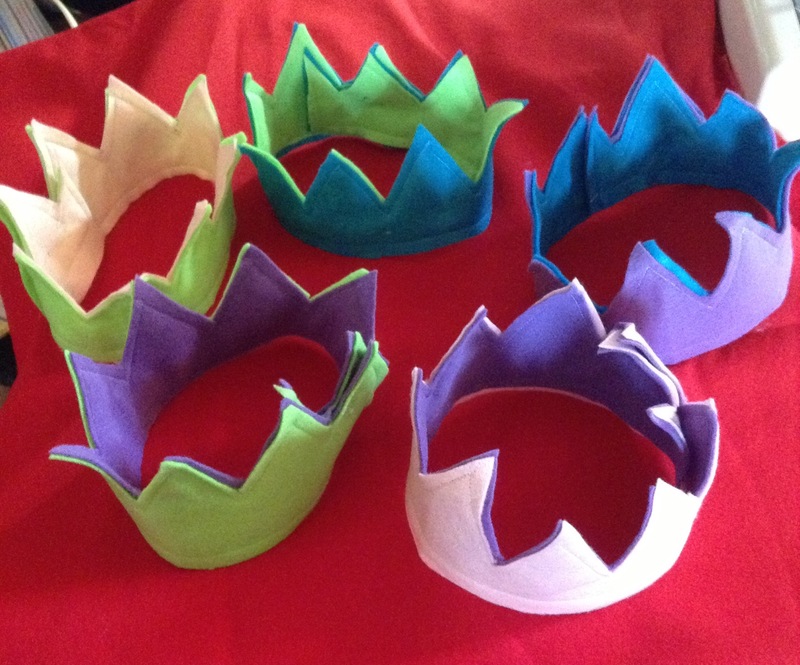 Red Bank has a street fair twice a year and this Spring, we had felt crowns available for the kids to decorate. 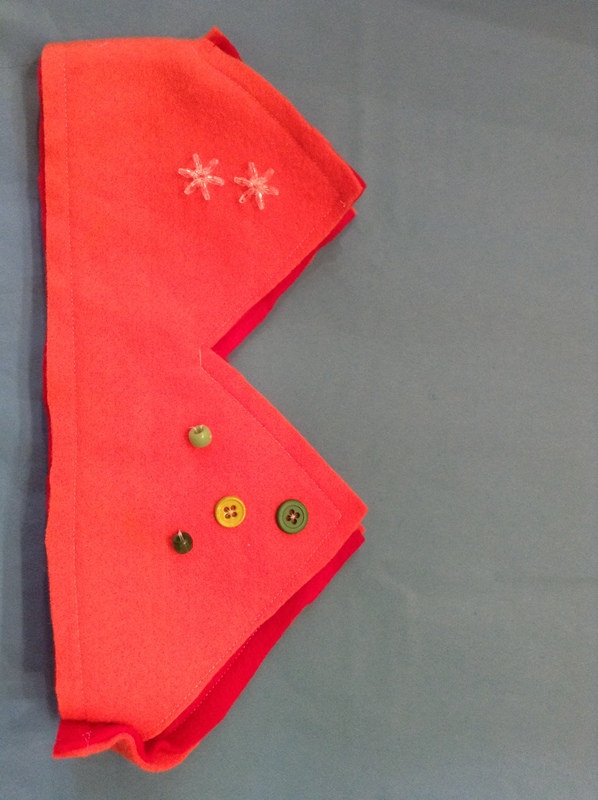 We took two strips of different colored felt, cut the points into the top and sewed them together. Then we had buckets of buttons and beads ready for the kids to pick out their “jewels”. We threaded needles ahead of time so we could sew them where directed. 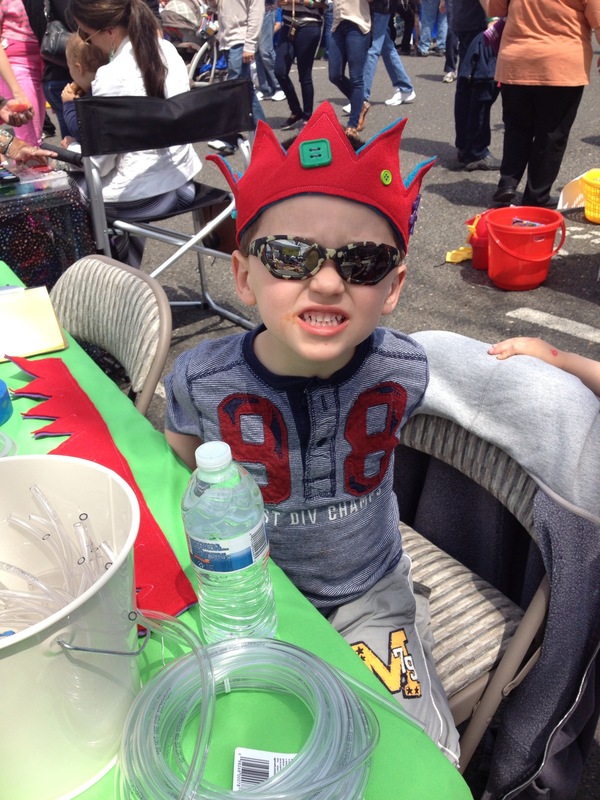 We charged $5 a crown and we were the hit of the street fair! As Memorial Day approaches, parents all over the country mentally prepare themselves for the annual car trip vacation. While we all understand the urge to use sound resistant earphones to block out bored and frustrated children, the authorities tend to frown on them, especially on the driver. Rather than muting the “Are we there yet”s, let us give you some tips on keeping the little ones occupied during the trip. Erica Mueller, in her article Tips for Traveling with Kids – LONG CAR TRIPS suggests bringing something new for your brood that they can get just before (or after) you leave. We did not do a lot of really long distance traveling when we were young, but the one trip I do remember, my grandmother had packets of books ready for us when we got in the car. Some were activity books, some were for reading, but all were designed to keep us busy. Becky, in her blog post Traveling with the Kids for the Holidays suggests bringing a map showing the route you plan to take. That way they can mark off cities or states they’ve passed. Learning to read a map is becoming a lost art in the age of electronic navigators but is very useful, especially if your kids ever decide to go on the Amazing Race. 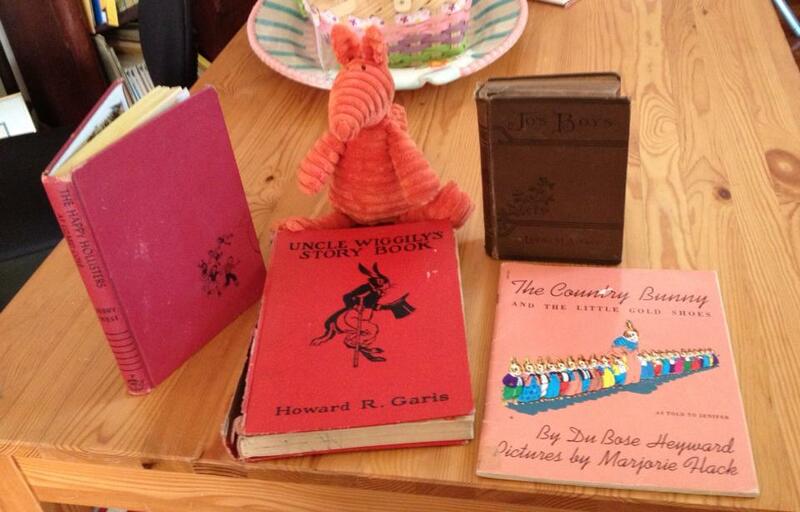 Children’s Book Day – What Was Your Favorite? 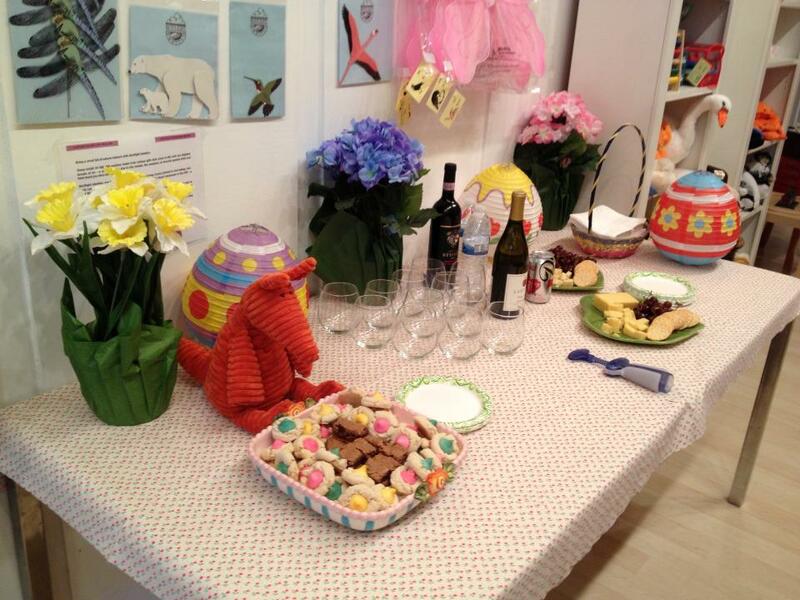 Tuesday, 4/2/13, was Children’s Book Day. We posted this picture of Clive showing our favorite Childrens Books on our Facebook page (come on over and like us, all the cool kids are), Twitter and Instagram. Along with the picture of our favorite childrens books, we asked the obviuos question, what is your favorite childrens book? We loved reading the responses and most made us think “oh, I forgot that one!” but there were also a couple we hadn’t heard of giving us something new to look for the next time we are in the bookstore. Thornton W Burgess Animal Stories – We are not familiar with these, so we’re looking forward to finding them and trying them out. So? What was your favorite book to read when you were growing up? Last night, we held our first Parent Workshop. 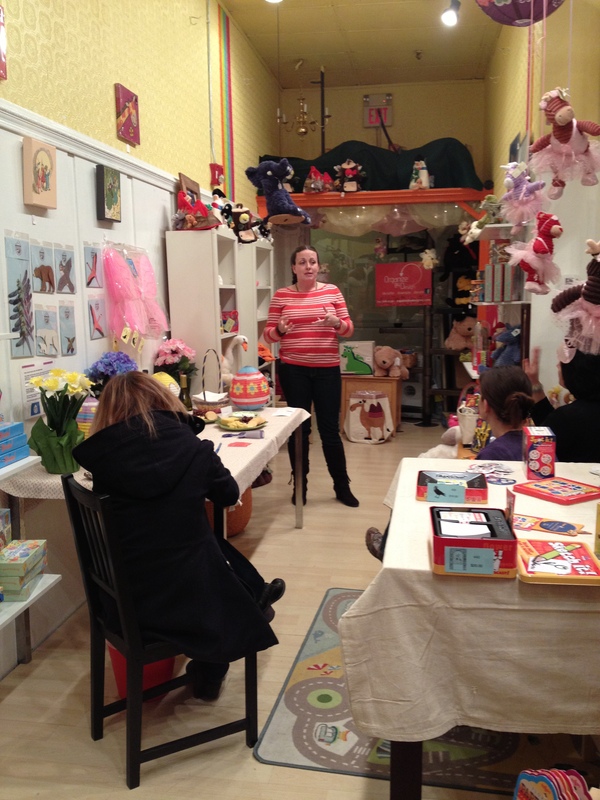 Jessica from Organize by Design came in and talked about getting toys (and clutter in general) under control. We had wine and cheese and Helen made cookies and brownies. Clive got very excited about the food! Clive! Get away from the cookies!! Do you have more than one of a toy? Look at the quality of the toys you have. Are the little pieces that come from happy meals worth saving? Hold onto the good quality toys. 2. Keep your kids from adding to the clutter by using the Buy One Purge One Rule. Every time something new comes in, something old needs to be donated. Have your kids think carefully when they want a new toy – what will they give up in exchange? 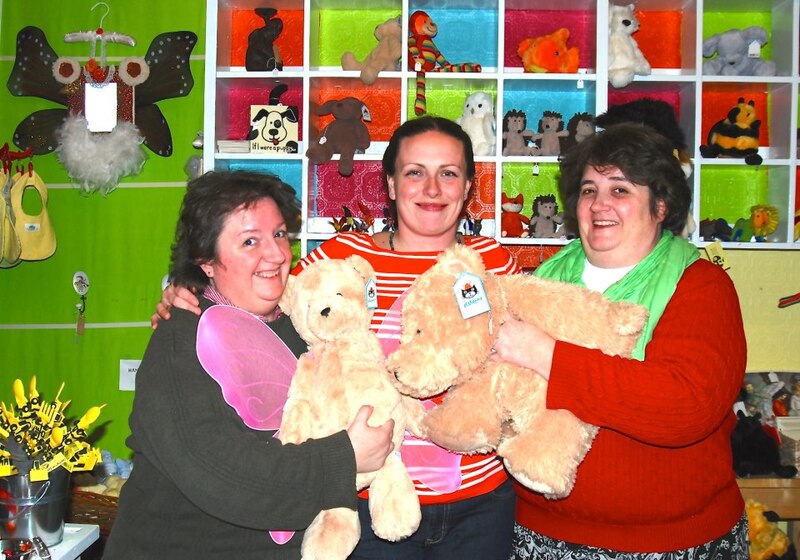 If you are cleaning out clutter, donate four or five items and then they can get a new toy or stuffed animal. 3. Educate your children about how little less fortunate children actually have. Help them want to share what they have. We all want to keep everything our children make and love, however this just promotes clutter. Get a crate/chest/box with a top. Everything you will keep for them over the next 18 years must fit into this box. Evaluate exactly what you want to keep – does it deserve a place in the box? If you are near Red Bank and have toys to give away, but don’t know what to do with them, Fragile Earth and Jessica want to help out. On the 15th of each month, Fragile Earth will have a bin available for donations and Jessica has a large network of shelters and schools that welcome gently used toys. We will make sure they get to deserving children. Jessica is also putting together pictures of some of the children who have received her donations in the past that we will have in the store so your children can see just who gets the toys they give away. There were some great questions from the parents and ideas exchanged. It was a really fun night. We are planning our next workshop and will let everyone know when we have the details finalized.